Chachapoyas, the capital of the Amazon Region of Peru, is one of the least visited places in a country that sees millions of tourists each year. However, this will soon change as travelers seeking to avoid the crowds in the south of the country are starting to venture into the lesser visited areas of Peru. Besides boasting the impressive Kuelap, there are other interesting sights around Chachapoyas. 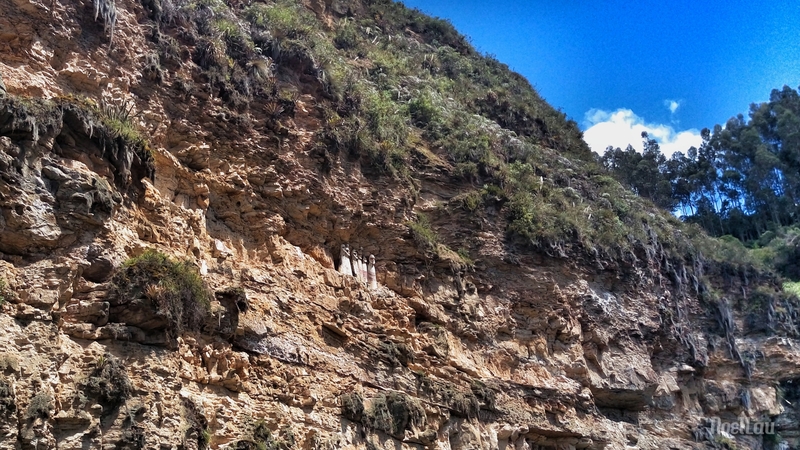 Karajia, located about 50km southeast of the cozy town of Chachapoyas, is a breathtaking sight. 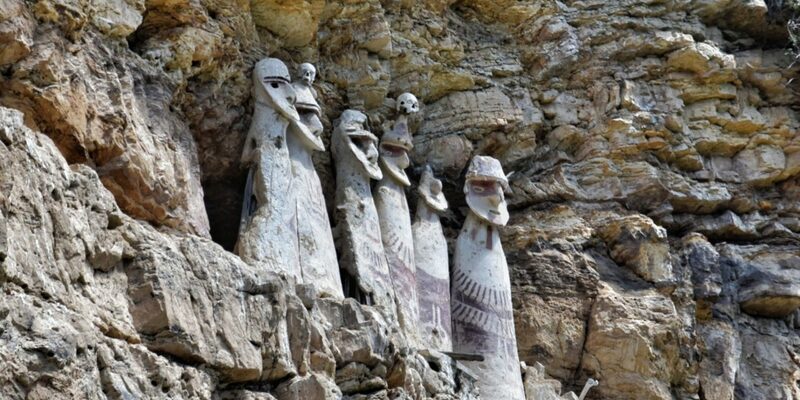 Perched on the side of a limestone cliff stand six sarcophagi. They were constructed of clay, sticks, and grasses. 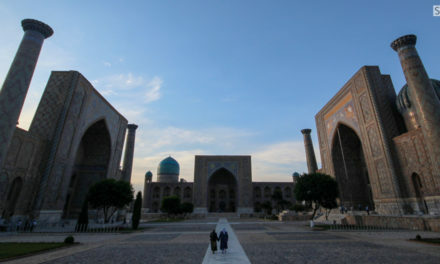 Each stands about 2.5m in height. They look like six limbless figures with protruding chins, staring eerily into the abyss. Some of the headpieces are adorned with human skulls. Riveting, they were discovered quite recently, in 1985. They were built by the Chachapoya people to house the remains of the high officials from Kuelap. According to radiocarbon dating, the sarcophagi of Karajia date from the years 1460-1470, just before the Chachapoyas were conquered by the Incas. Inside each sarcophagus were mummies and offerings, but they had been removed either by looters or archaeologists. 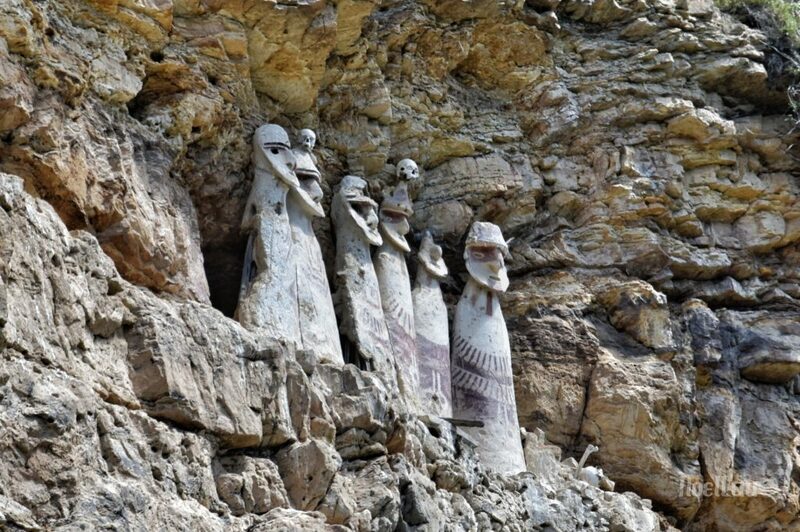 The Chachapoyas mummified important individuals of their society and placed them in sarcophagi. These important sarcophagi were then placed in high places, difficult to access locations, looking towards the rising sun or a village, and close to water. Today, only the empty shells of the sarcophagi remain as testament to the people who once thrived in this region.